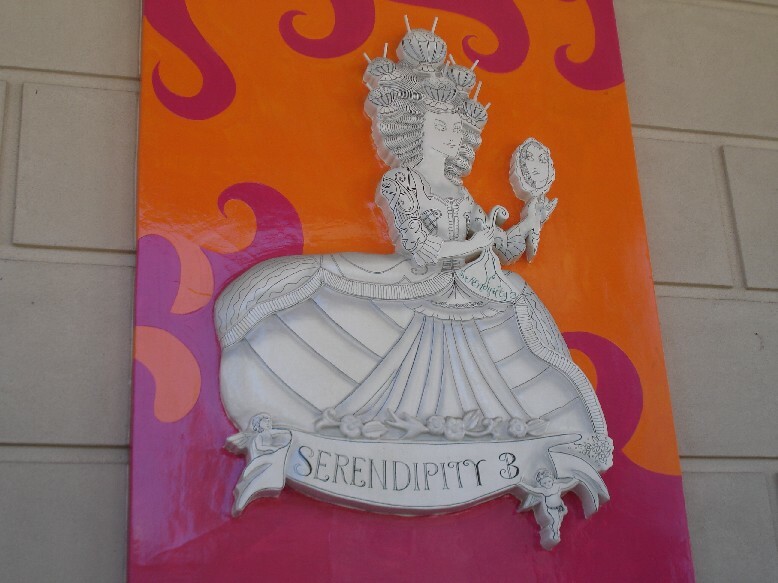 I’ve always wanted to try the Frrrozen Hot Chocolate from Serendipity, as popularized in the movie Serendipity starring John Cusak and Kate Beckinsale. But New York is a far ways to go so I was delighted to see they opened one in Las Vegas at Caesars Palace. Of course it lacks the history and character of the New York store (est. 1954) but it was still pretty cute. The menu features generously portioned standard American fare (similar to Cheesecake Factory) with an emphasis on ice cream treats and fancy chocolate and coffee beverages. I assumed they’d have a menu available online so I didn’t grab one (turns out the menu for their New York location differs slightly from the Vegas one) so I can’t remember how much everything cost. Except the Frrrozen Hot Chocolate, which I clearly remember as costing a whopping $9.75! It was really good though. It’s like a Starbucks Frappuccino but instead of coffee, it has a really rich, delicious chocolate flavor. It’s the perfect dessert to share with your date. 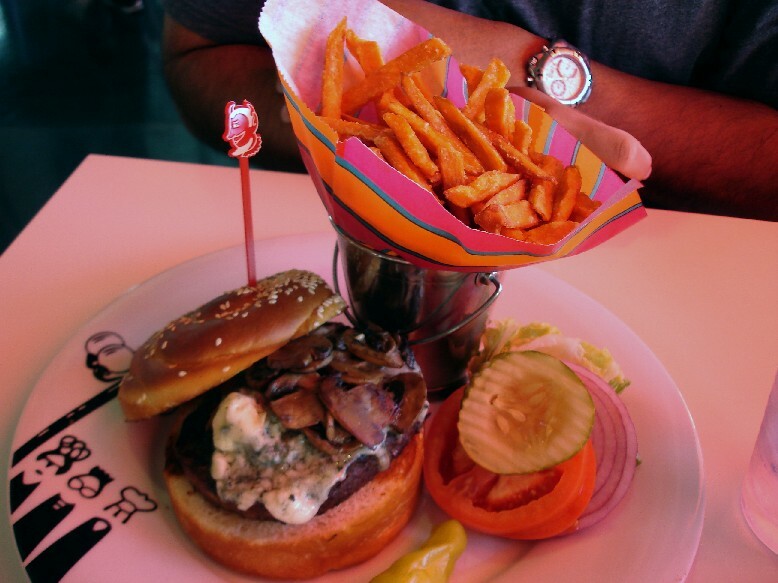 Hubby had a Burger with mushrooms and blue cheese, served with sweet potato fries. 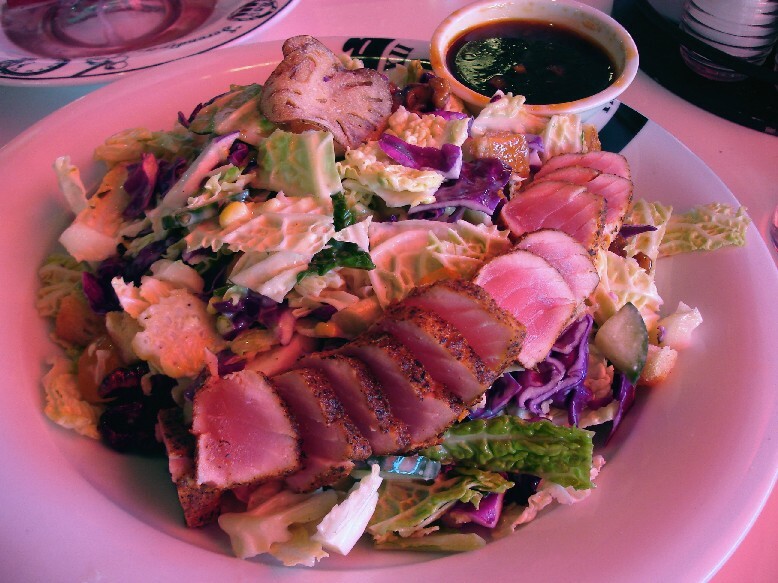 I had a Blackened Ahi Salad (around $17 or so). The portion sizes were huge. Oooh… I’m already craving the Frrrozen Hot Chocolate. The closest thing I’ve had is the frozen chocolate drink at Godiva, which is pretty good too. FYI, there’s a take-out window too. It’s great if you want to just try the Frrrozen Hot Chocolate without waiting in line. My mom and I actually went twice to the LV one. First JUST to eat a meal – she got the chinese chix salad, which she LOVED (and that’s saying a lot…she’s particular about it), and I had the mac & cheese, which was REALLY CHEESY but REALLY YUMMY. I remember our portions being huge too…which was tough since we were going straight to Bette Midler’s show right after. After the Bette Midler show (which was at Caesar’s) we went back JUST to eat the Frrrozen Hot Chocolate. At that time (around 1030 pm) it was good because they have a counter, which is first come first serve, so we just went there and didn’t have to wait for a table. I’ve been to the original location in New York City (which is the same one featured in the movie Serendipity), and I have to say that the original one does have a bit more character in its design and atmosphere…more funky and quirky. This LV location is great tho because the wait is not NEARLY as long (in NY we were told the wait was around 2 HOURS…and this was at like 230 in the afternoon!). 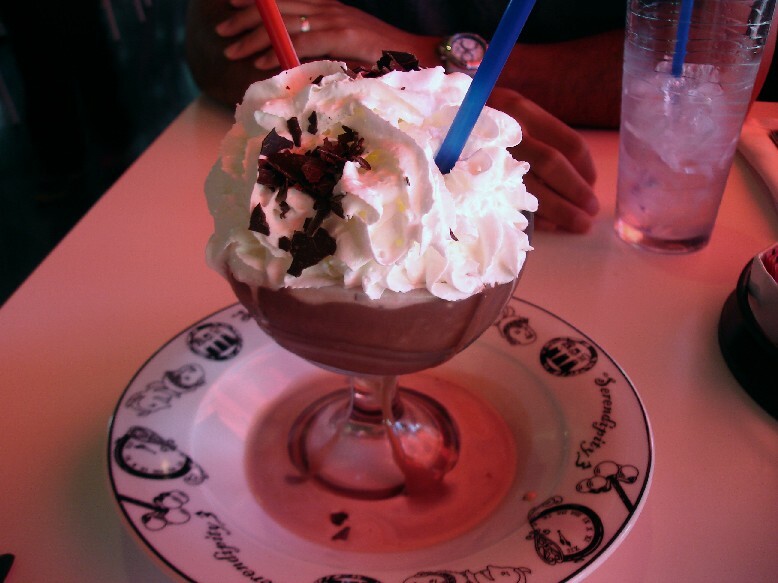 If you ever have the chance to go to a Serendipity, you NEED TO GO! It’s totally worth it! Glad you got to experience it! BTW, how were the sweet potato fries? Ever since trying the ones at The Counter, I’ve kinda gotten on a kick with those…like to try them at different places. I know, each meal there is like 2 meals in one. Our hotel room didn’t have a fridge, so we couldn’t take home our leftovers. Sweet potato fries were good. Similar to the ones at the Counter, but thicker (thus, you can really taste the sweet potato).